Discover the door to your world! Please check your selection carefully! We custom build the frame and prep the door to your specifications. Order is made to-order and is non-cancellable, non-returnable and non-refundable. Delivery surcharge for each additional door $35.00. Expert Advice! Call us for fast and friendly service! Trade and volume discounts are available! Unit Size: 53" x 98"
Rough Opening Size: 53-3/4" x 98-1/2"
We ship directly to your job site in the 48 contiguous United States! How long will it take for my order to ship? How is my order shipped? Your order will be shipped ground via freight company (LTL). Our shipping is a curbside delivery with lift-gate and pallet jack service. Curbside delivery service provides delivery of your order to the curb at the end of your driveway. This service does not include set up or assembly of items or removal of packaging materials. We will provide you with all necessary delivery information to prepare you for delivery, including: full carrier information, contact numbers, a link to the freight carrier's website and tracking numbers. You will be able to track your shipment online from departure to arrival. The delivery terminal will call you when your item arrives to schedule a delivery appointment. Orders are shipped on a solid and secure crate. The crate is designed to protect your door and ensure that it will arrive in perfect condition. We only ship with freight companies who provide our customers with an online tracking system and superior service. 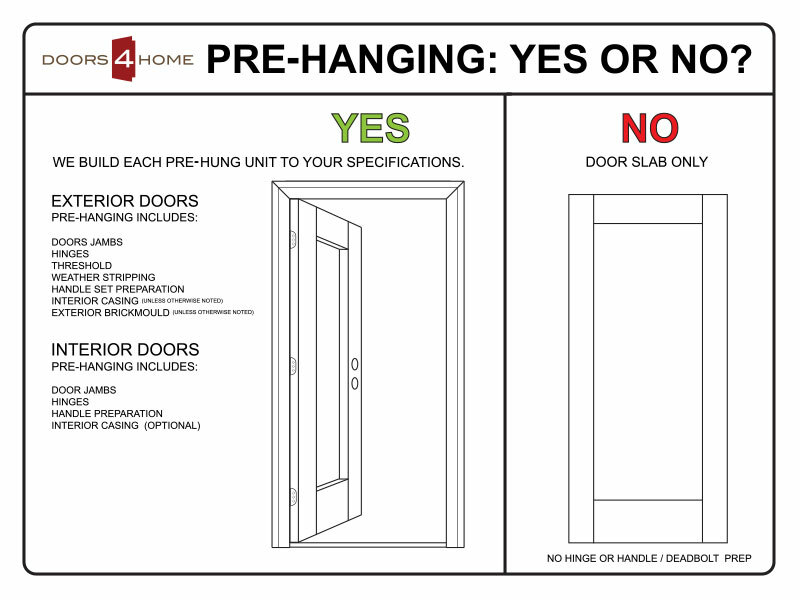 At Doors4Home we offer a factory pre-hanging option. 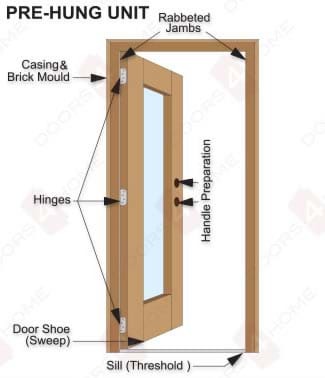 By selecting the pre-hanging option, you will receive a door hinged, prepped for handle and assembled in a frame (also called the door "jamb"). Factory pre-hanging ensures easy installation with a precise fit ready to install in the door opening, with no on-site assembly required. This reduces construction time and lowers project cost. 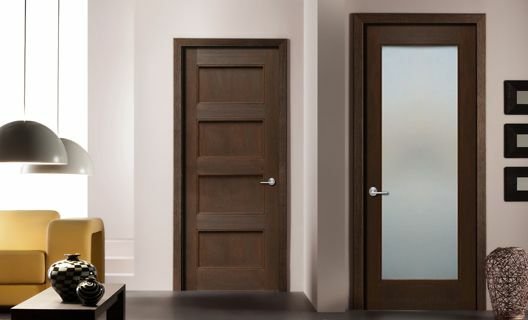 If the pre-hung door is also factory finished, this further reduces steps and cost in the overall construction process. Doors are hung on rabbetted jambs kerfed (slotted) for weather-stripping. 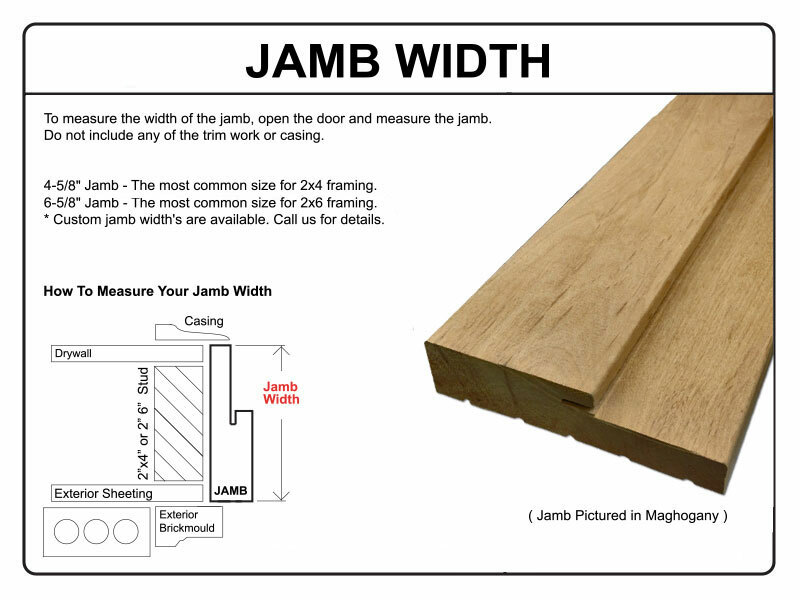 Jamb's width: To measure the width of the jamb, open the door and measure the jamb. Do not include any of the trim work or casing. 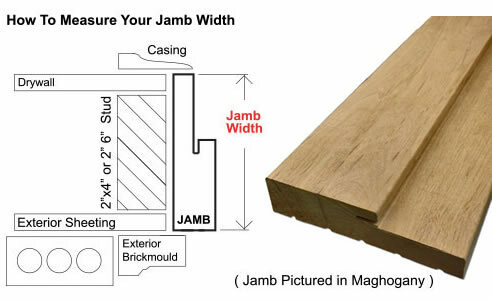 For additional information read: what is my jamb width. 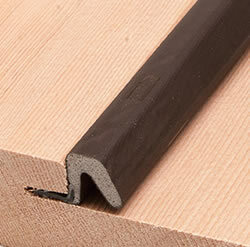 4-9/16" Jamb - The most common size for 2x4 framing. 6-5/8" Jamb - The most common size for 2x6 framing. * Custom jamb width's are available. Call us for details. 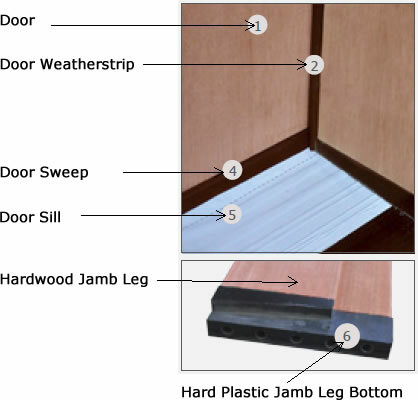 All pre-hung entryways utilize a unique protective jamb leg boots, which are hard rigid plastic parts machined to perfectly match the profile on the bottom edge of a jamb leg. We also use mull post boots at the bottom of all mull posts which are positioned between doors and sidelights. 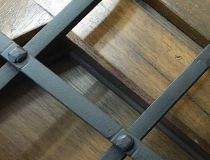 This method of assembly inhibits the hardwood jamb legs and mull posts from rotting over time due to the absorption of water up from the bottom edge of the entryway. 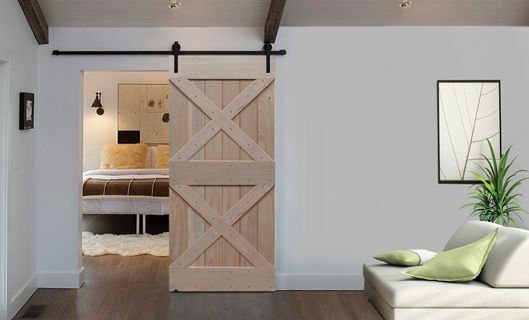 All prehung units use 3 ball-bearing hinges on 6'-8" tall doors and 4 hinges on 8'-0" tall doors. 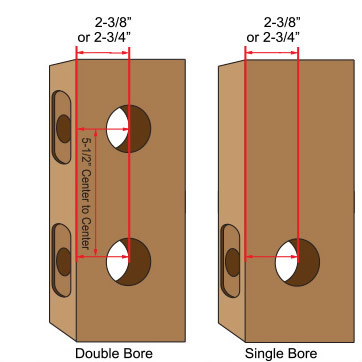 1-3/4" thick doors use 4 inch hinges, while 2-1/4" thick doors use 5" hinges. 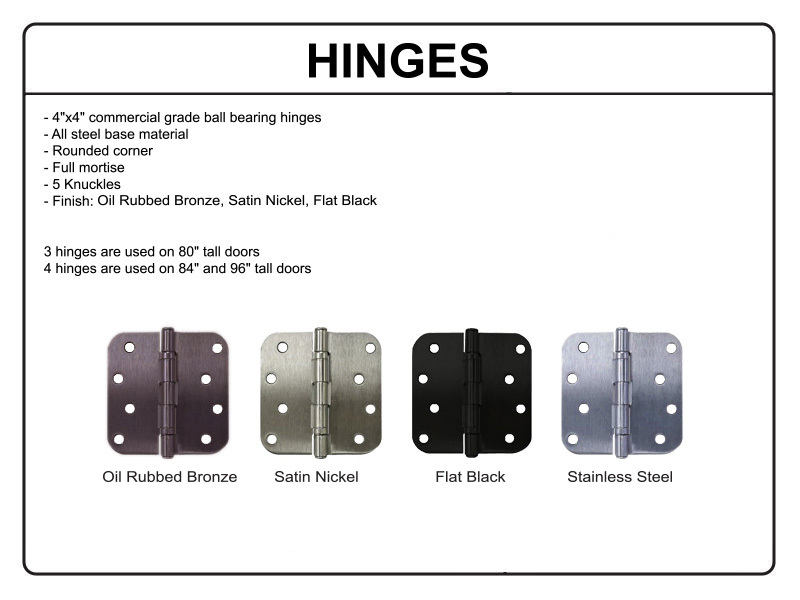 Choose from these three hinge color options for your pre-hung entry door unit: Oil Rubbed Bronze, Satin Nickel or Flat Black. 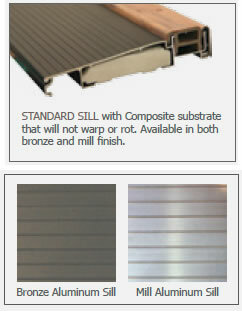 Composite adjustable Aluminum sill is used to prevent from rotting, warping or deteriorating over time. 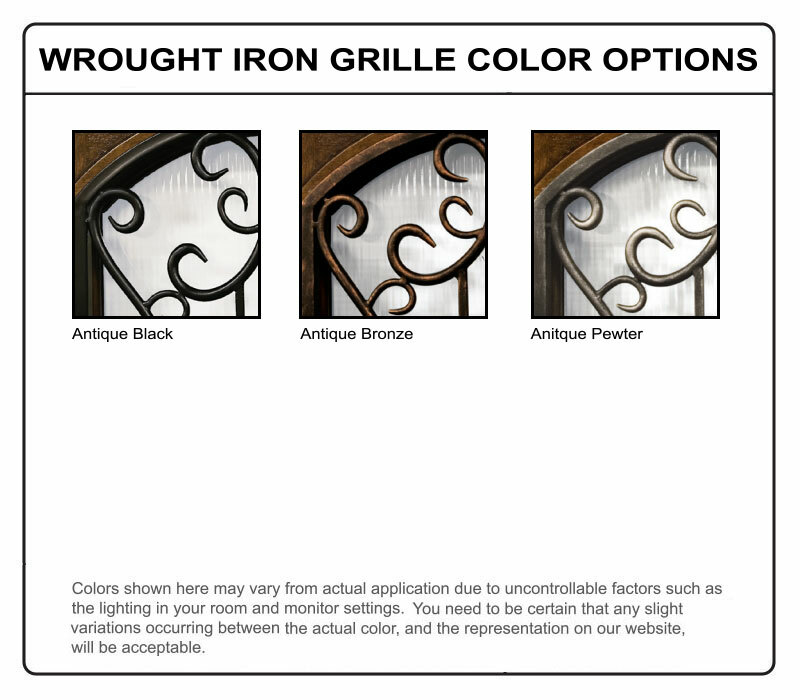 Available in three finishes: Brass, Mill Aluminum or Bronze to match your entry and decor. 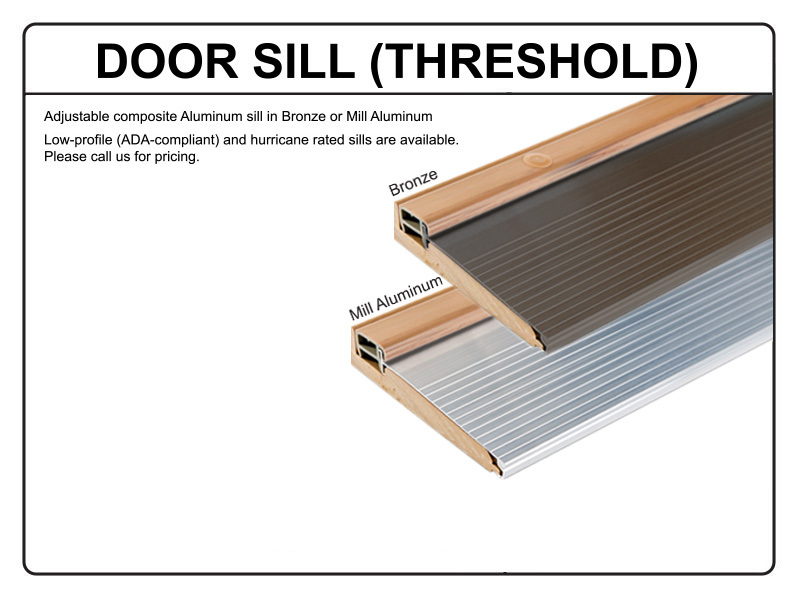 Low-profile (ADA-compliant) sills are available, please call us for pricing. We can provide special in-swing or out-swing sills designed for Florida and coastal use, please call us for details and pricing. 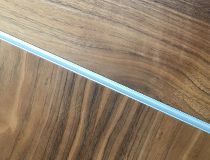 High quality press on Q-lon weatherstripping. 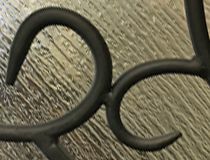 Made of polyethylene-clad urethane foam. The weatherstripping is applied at the top and sides of the door to keep out drafts. Exterior brickmould is installed around the exterior perimeter of a door. The primary function of exterior brickmould is to seal gaps that occur between a wall and door. The installation of exterior brickmould prevents water from seeping into the wall from the outside. 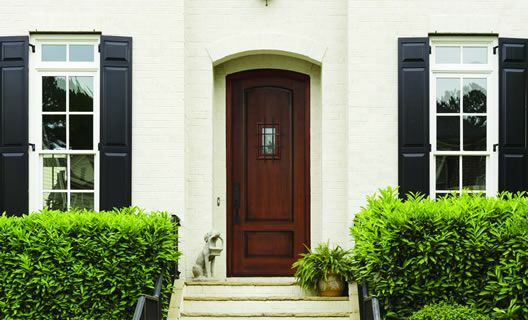 Exterior trim also serves a decorative function by providing visual contrast to the area around the doors. A standard WM180 milled brickmould is 2" wide and will match the jambs' wood species. 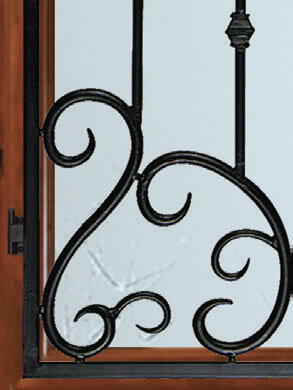 Interior casing is installed around the interior perimeter of a door. It covers the gaps between the edges of the door frame and the surrounding wall. 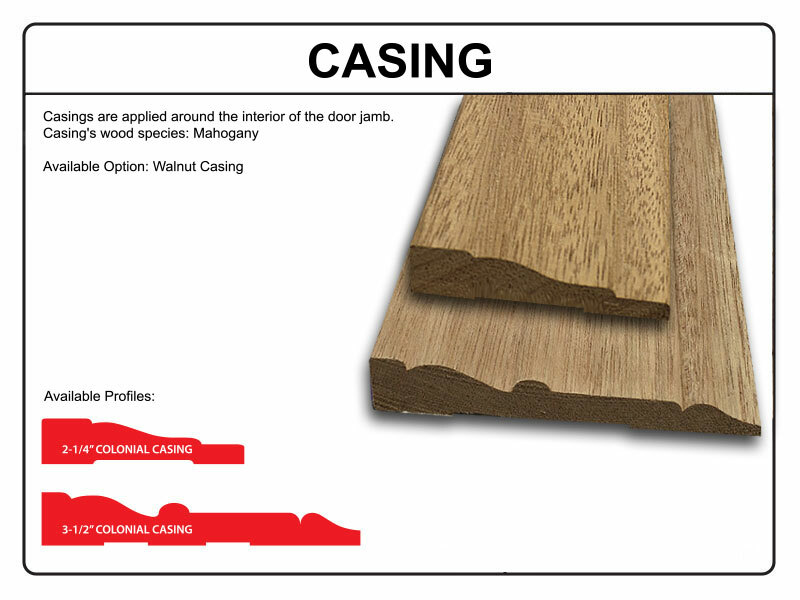 A standard milled interior casing is 2-1/4" wide for standard doors and will match the jambs' wood species. 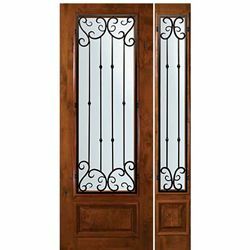 Arch top double doors are 3-1/4" wide. 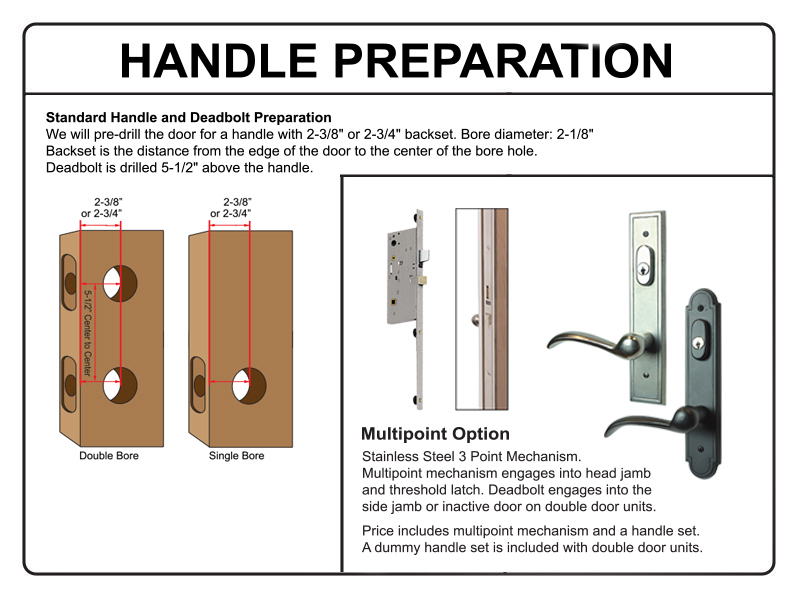 We will pre-drill the door for a handle with 2-3/8" or 2-3/4" backset. Backset is the distance from the edge of the door to the center of the bore hole. Deadbolt is drilled 5-1/2" above the handle. 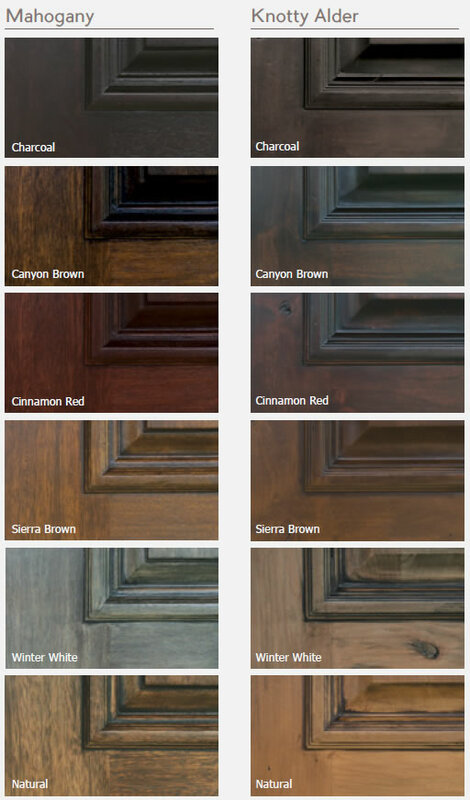 Selecting a factory finish option will produce a door unit with a beautiful, protective finish that promotes long life, beauty, and accentuates the natural allure and texture of the wood grain. 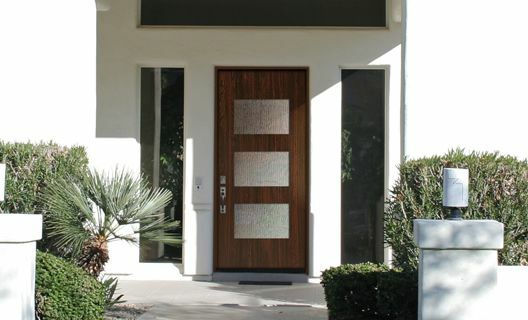 GlassCraft has developed an innovative and environmentally sound factory finish option. 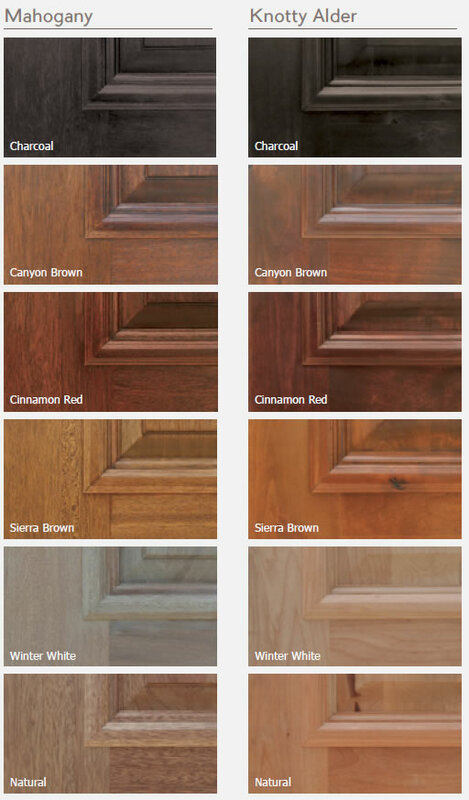 Exclusive 10-step finishing system applies beautifully colored wood stains while adding multiple protective layers of crystal clear urethane finish coats to your wood door. Each coat is impregnated with ultraviolet UV-inhibitors and additional moisture blocking technology to keep your door looking beautiful. The process involves the deep penetration of tinted solution into the deep layers of each wood cell to prevent water or moisture absorption. 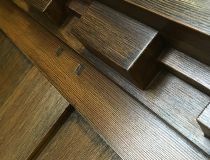 The wood door is also processed through a laser-controlled convection-oven cure not just once, but three times to ensure the perfect wood surface curing. GlassCraft’s manufacturing finish facility is inspected and certified by the TCEQ (registration number CN603390188). 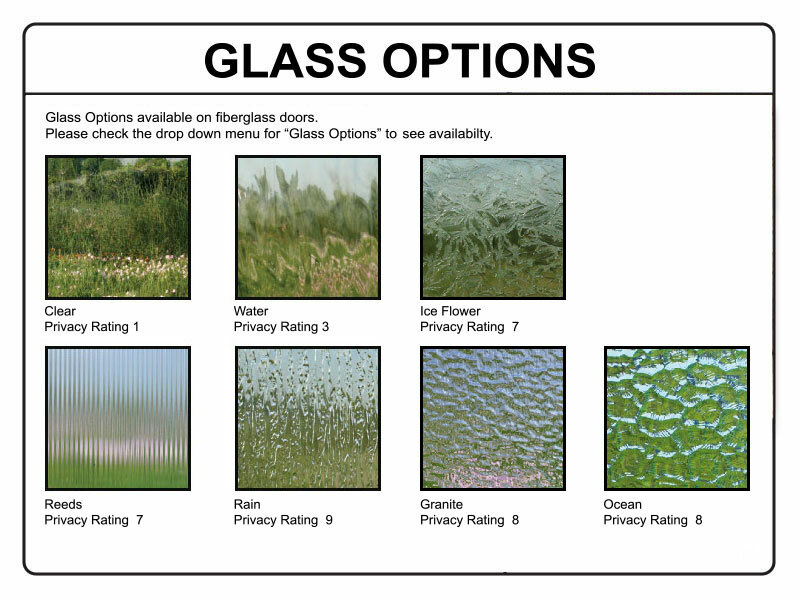 This is one more way GlassCraft is helping to provide you with information needed to make an environmentally informed purchase. Ordering a factory finish will add an additional 1-2 weeks to the delivery time. Our traditional finish has been designed to maximize the beautiful rich mahogany and knotty alder wood with a long-lasting 10-step finish process. Our antique finish options feature the deep rich patina that enhance the warmth and antique character of wood, without the additional distressed markings and patterns. Our distressed finish provides that special antique patina with distinctive distressed markings and patterns that enhance the aged beauty of wood. This finish is made with a 12-step process that adds a texturized surface such as faux indentations, pits, cracks, scores, and wormholes. Colors shown here may vary from actual application due to uncontrollable factors such as the lighting in your room and monitor settings. 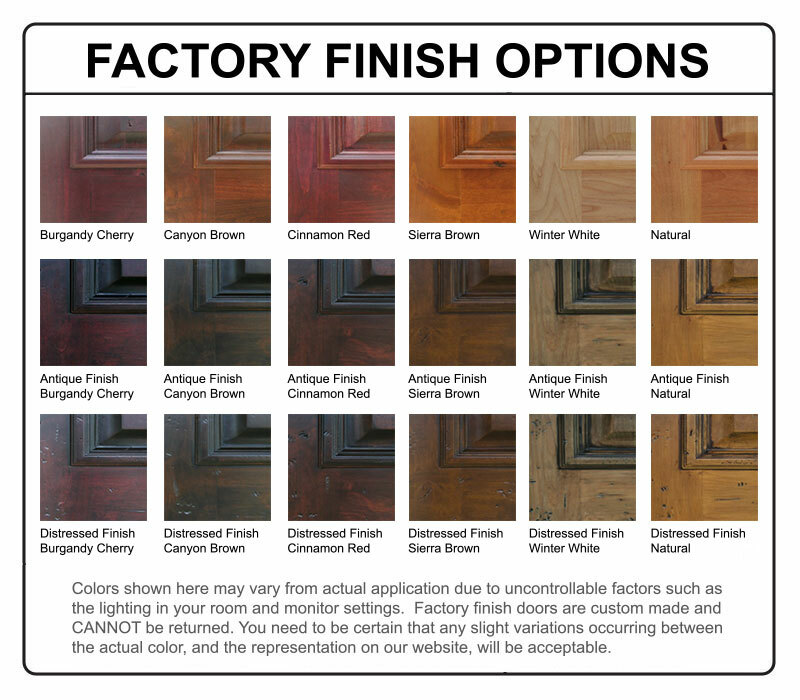 Factory finish doors are custom made and CANNOT be returned. You need to be certain that any slight variations occurring between the actual color, and the representation on our website must be accepted. We are proud to be an Authorized Dealer for the brands that we carry. When you buy from an authorized dealer, you are assured a high level of reliability and honesty. We buy directly from the manufacturers so that you receive only factory-fresh merchandise with a full warranty. The quality manufacturers we are partnered with have product specialists who hold regular training sessions with our sales staff, assuring a high level of product knowledge. We have to satisfy their standards in order to become an authorized dealer. Our high level of service continues after you have made your sale. 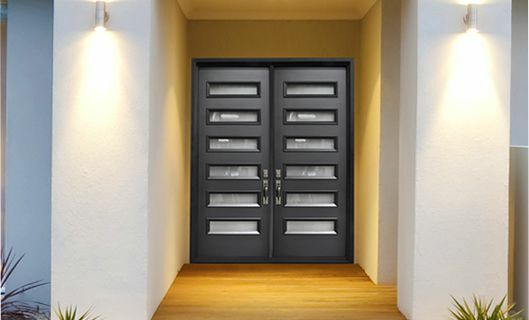 Our customer service representatives can assist you with installation instructions, maintenance and care of your new door. 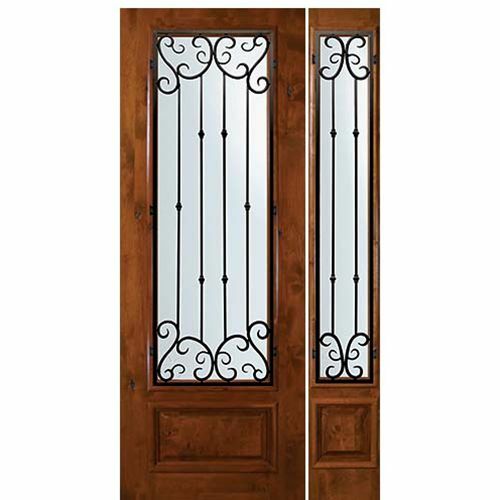 We take great pride in the quality and craftsmanship of the doors we sell. Attention to detail in design, materials and construction is always at the forefront. We encourage you to inspect the item upon receipt. If you have a concern or believe there is a quality issue, we will work with you to correct it, in accordance with our store policies. Please read the manufacturer warranty thoroughly and follow all requirements.